Home > New ways of drinking beer! New ways of drinking beer! Man pours beer while friend holds on to golf cart. Do Genetics Determine How Much You Drink? Do you tend to (stupidly) drink yourself into oblivion when you head out to the bar or hang out with friends? You might not just be making terrible choices. It might not be the booze making you lose your mind while you make a fool of yourself. It’s possible you can blame it all on your genes, rather than the alcohol. A recent report indicates that researchers may very well have discovered a gene that could explain why so many people gravitate to alcohol as though it were some sort of an irresistible siren and why others simply don’t care for the stuff at all. It’s called beta-Klotho, and those with this particular gene tend to shy away from drowning in beer, while those without it are much less discerning when it comes to what and how much they imbibe. Researchers tested this theory on mice, and they displayed those results: they tended to enjoy alcohol a lot more when they lacked this gene. In a study of over 100,000 people of European descent, researchers found people who had one version of beta-Klotho ended up reporting that they drank less on average. According to Dr. David Mangelsdorf of the University of Texas Southwestern Medical Center, who worked on the study, there was an apparent variation between people with and without the gene when it came to drinking preferences. Out of the individuals in the study, about 42 percent of individuals involved had the low-drinking version of the gene, which is different regarding a single-nucleotide polymorphism (SNP) from the one that was seen in most people. This variation, Mangelsdorf and the rest of the researchers hope, could eventually be used as the basis for improvement upon treatment of those plagued by alcoholism or a penchant for drinking a little too much. This could mean a world of difference when it comes to affecting health on a global scale. “Excessive alcohol consumption is a major public health problem worldwide, causing an estimated 3.3 million deaths in 2012,” Mangelsdorf wrote in the latest report on the special gene. In fact, out of the 140 million Americans who drink alcohol, about 23 percent of them could be sorted into the binge drinker category, which is comprised of four to five drinks in a row. Worse still, 6 percent are heavy drinkers who binge drink several days out of the month. Hopefully, further research into what this gene actually means and its absence or presence in human beings will result in better, more thorough ways to help plan and bring treatment to the people who need it — and help those out there who are just making the worst decisions they can about drinking. Bud Light's Up-For-Whatever campaign is leaving another sour, watered-down taste in people's mouths, and it's not the beer. The campaign, which was launched in January, encourages drinkers to be up for whatever when drinking their beer, because "you never know where it'll end up". Now, they're encouraging drinkers to take the word "No" out of their vocabulary. Some Bud Light bottles have the message "The perfect beer for removing 'No' from your vocabulary for the night" printed on their new label. The bottle started to gain attention after a picture of it was posted to the "funny sub-reddit". Users were quick to point out that the message could be interrupted in many questionable ways. Humans have enjoyed beer since the dawn of civilization. Here are some interesting facts about the history of beer. 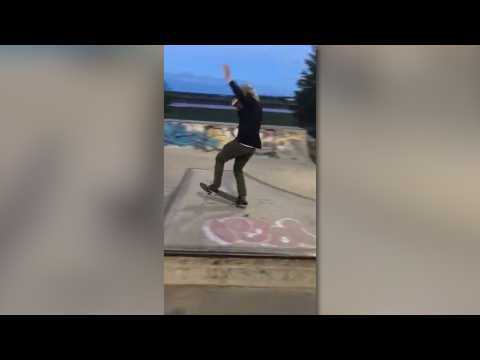 Showing off while skateboarding goes wrong. Last week the wrestling world collectively froze when Steve Austin said he was taking a break from beer. According to ComicBook.com, Austin never explicitly said he was done drinking, but he did leave room for things to be taken out of context. However, the WWE icon not only clarified he was just limiting alcohol intake for a diet, but pledged he’ll pound cold ones until he’s dead. When I’m trying to meet a deadline, if I’m trying to get in shape, then I’ve gotta eliminate the alcohol if I wanna burn fat. I enjoy alcohol responsibly as an adult so, therefore, I will probably drink until my final day on Earth. tic. [I'm] sticking to my exact macros. I appreciate it, Dallas. Scientists in Canada have developed the world’s first beer made from cannabis. According to Geek.com, many have tried but few have actually made bona-fide cannabis beer. Brewers in states like Vermont and Oregon have incorporated the herb into their drinks. But mostly they have done so by including cannabis oil. But Toronto startup Province Brands took a different route for their new beverage. “That’s not what we do. Our beer is brewed from the stalks, stems, and roots of the cannabis plant.” Dooma Wendschuh Province Brands In October, Canada will become the second country to legalize recreational marijuana use. And Canadian companies are scrambling to tap into the growing sector. The Guardian estimates the Canadian weed business could earn $9 to $17 billion in the future.